Good graphic design can automatically increase your profits. Bad graphic design can kill your conversions and profits. As a qualified graphic designer, I can teach you how to profit from good design and how to avoid losing sales due to bad design. Whether you realize it or not, good graphic design is often the psychological trigger that causes your prospect’s mind to embrace your offer, making your sales message as irresistible as can be. It drives me crazy when I see friends try to run their business online with the wrong graphics; they are shooting themselves in the foot. Their products and services are good, but their message doesn’t get through to the potential customer. When I ask them why their page design looks random or haphazard, the response I hear over and over is that they can’t afford to hire a professional designer. That’s the frustration! It doesn’t matter how good the product or service is, if the message doesn’t make the potential buyer sit up and take notice, the conversion doesn’t happen. I see this over and over. When I first entered the world of Internet Marketing years ago, one thing became brutally clear – good response-generating design was sorely lacking. From blogs to sales pages, websites to ebooks, the content was good, but the design did more to push away potential buyers than to attract them and get them to reach for their credit card. This breaks my heart because I KNOW there are many ways you can create more magnetic and professional looking webpages, websites, ebooks, etc. without having to pay hundreds of dollars outsourcing to a professional graphic designer. That’s why I decided to write, “Graphic Design Impact – Design Secrets That Sell,” an easy to understand book specifically written with the online entrepreneur in mind. This book helps you make sense of the millions of design options out there. It is a heavily illustrated and breaks down the concepts into practical easy to understand bite size pieces. It takes away the “intimidation factor” and replaces it with the “I can do it!” attitude. Graphics impact your profits and conversions more than you may realize. That’s a fact. Communication and getting your reader to take the action you desire, is the goal. If your message doesn’t influence the potential customer, that’s all they will be – potential. Remember the saying, “A confused mind doesn’t buy.” You MUST take the confusion out of the equation. Good design choices help deliver your message in a clear and supportive manner. It’s all about the customer. Connect with them and deliver your features and benefits in a way that makes them want to click the Buy button. How Do You CAPTURE Your Prospect’s Attention? I realized many online entrepreneurs were missing the boat when it comes to capturing their prospect’s attention. There are many ways and techniques to help people want to buy. From color choice to psychological triggers, you can make your message as irresistible as it can be. However, just as the right choice can help you, doing it the wrong way can hurt you. The key to remember here is that your message is the same; it’s the delivery that changes. Once you have connected with your potential customer the next step is getting them to purchase. Good page design can go a long way towards subtly guiding your reader towards the call to action. Whether your call to action is an opt-in box, buy button, or whatever, purposeful design can guide their eye through the page towards your desired result. Less is More – Place text on the page to make your visitors want to sit back, relax, and read on! Breaking the Frame – Use the visual frame (the computer screen) to your advantage, creating more interest and ultimately convert your copy into sales. Mind Control – Did you know you can actually control where your prospect looks on the screen? There are simple techniques you can use to guide your traffic to read what YOU want them to read first, and gently guide your reader towards the “Buy Now!” button. Logo Design – A correctly designed logo will convey a powerful message without words. Typography – Also known as fonts, fonts, fonts! It’s important (and easy) to choose exactly the right fonts from the thousands and thousands of choices once you know my secrets. The Psychology of Color – Understanding how color choice influences your prospective buyer’s decision making process. Layout Design – Why are some pages more appealing than others? You’ve got to understand what makes the difference between good and bad page design. Good design helps you create a page that flows well, is easy on the eye, and ultimately directs your prospect towards the goal – making the purchase. Best of all, good design is evergreen. Your design efforts will not be affected by the latest Google Update or trend. Believe me; I understand the “money’s tight” factor. In fact, that was part of why I wrote this. I want you to succeed, and I understand not having the budget to hire a professional just yet. The things I’ve learned in my graphic design career and education is that most graphic design concepts can be easily applied without having to hire a professional. 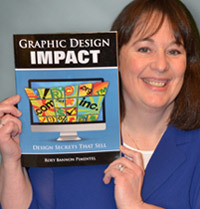 It’s just a matter of learning the core concepts, and that is exactly the reason I published my book, “Graphic Design Impact” (which took me over two full years to create). I went to school for you and I’m handing you all the golden nuggets that will help you finally see the results you’ve been missing out on. Another way you can benefit from Graphic Design Impact is to become an affiliate. Roey Bannon Pimentel, M.A., is a graphic designer and photographer. Her focus is on advertising design. Roey has many awards to her credit and is an accomplished speaker and facilitator. Her work has been exhibited in galleries and publications. Roey is a natural born teacher with the passion to share her knowledge of design. Helping others succeed in business through better design is one of her goals. She is passionate about the importance of graphic design in business and in our daily lives.